PARRISH – In the church year, Advent is the four-week season before Christmas. During Advent, visitors are invited to come to the 97-acre campus of DaySpring Episcopal Center for times of personal and corporate reflection. In the Anglican tradition, Advent is a season of anticipation. The season of Advent in 2018 runs from Sunday, Dec. 2 to Monday, Dec. 24. It is a time when we prepare for the birth of Jesus, separate from the Christmas season. For Advent, The Episcopal Church’s new Journeying the Way of Love home and group study offers four sessions to be explored at home as we await the coming of Christ by moving through the first two chapters of the Gospel of Luke. Luke’s gospel provides a pattern for understanding how we can live the Way of Love as individuals or groups, as families and friends, as a community, and out in the world. A December Way of Love Advent Calendar has scripture readings for each day of the month. Dec. 4 Advent Quiet Day: Bishop Dabney Smith will hold an Advent Quiet Day on Tuesday, Dec. 4. The theme for 2018 is The Disciplined Life: Put on the Armor of Light. 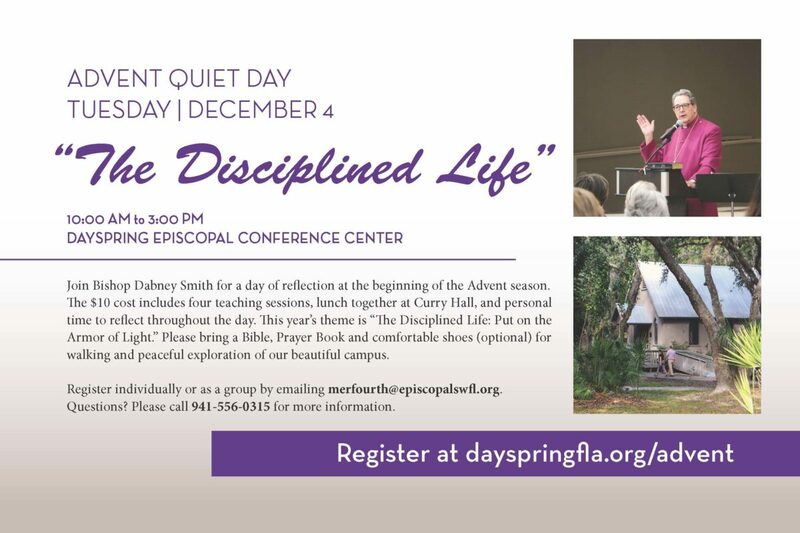 To register for the day’s teaching, which includes a $10 lunch, email merfourth@episcopalswfl.org or register HERE. Dec. 5 Holy Eucharist & Lunch: Each month, clergy from across the Diocese of Southwest Florida come to DaySpring’s St. Thomas Chapel to celebrate the Holy Eucharist at 11 a.m. The Rev. Jonathan Evans of St. Boniface Church, Siesta Key, Sarasota, will preach and celebrate. Lunch, for $10, follows. Bring your group, or come individually. To reserve lunch, email reservations@dayspringfla.org. Pray at St. Thomas Chapel: Pilgrims may use historic St. Thomas Chapel for silent prayer and reflection during regular hours. Visitors often take walks between prayer and reading. In the chapel there are also copies of the Book of Common Prayer. The chapel is open daily from 9 to 5 p.m., or by request. Individuals should check in at the front desk to tell them you are on campus. Walk the Labyrinth: Next to the chapel is the Episcopal Church Women Labyrinth. The labyrinth, inspired by the famous labyrinth at Chartres Cathedral, is not a maze; instead it is a circuitous route from the outside to the center of the design. Pligrims walk to the interior while praying or meditating. Spend Quiet Time on Our Trails: DaySpring has nature trails that crisscross our 97-acre woodland campus. These trails are open during the day for group or individual walks. Our outdoor chapel is also available. Come for a Meal: For many days in Advent, our dining room at Curry Hall is open to visitors, both groups and indviduals. Please call ahead. Bring a Group: Call ahead to reservations to bring a group for quiet prayer and a meal. For group visits, please contact reservations at 941-776-1018. There are four weekly Collects, or prayers, relating to each of the four weeks of Advent. the Holy Spirit, be honor and glory, now and for ever. Amen.